5 Tips Tuesday- Everything Wedding! My first tip is to you is, while thinking about your wedding hair is to not be afraid of accessories! Small veils coupled with really whimsical feathers give off a very classic look. Especially when you wear deep red or maroon lip stick like this bride. I would say though if you do opt for some sort of hair accessories make sure you feel comfortable. You can also take it off for your reception as to have two different looks at your wedding- like the celebrities do! My second wedding planning tip is that if you are thinking about doing an up-do hairstyle, think about doing loose pinned curls as opposed to really stiff -high hair. I think this bride looks effortless and not to mention beautiful. My third wedding planning tip is to have something interactive for your guests to do at your wedding. I really like this idea below. Its a little card style memento for your guest to fill out at your wedding. I think it is awesome because it will be a constant reminder of who shared your special day with you and will also give you an opportunity to gather some advice from couples who have been where you are now. This is also super interactive! I am a very visual person so having portraits of everyone from my wedding would be something I would always cherish. People always like to have something keeping them entertained whether it be while attending weddings or other events, so keep little inexpensive things like this in mind. Small details can really bring your BIG day together. 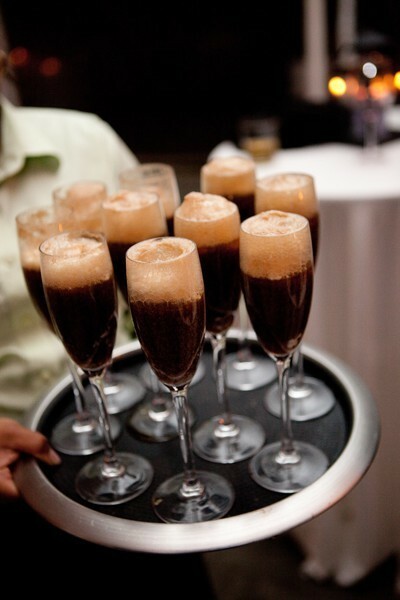 Lastly, whether or not your going to have an open bar at your wedding you can always do something completely different like these root-beer floats in very classy champagne glasses. Everyone like root beer floats ..right? Not to mention they are age appropriate for everyone! Well that is all I have for today. Thank you all for reading and please feel free to comment below . We love feedback! Also, visit our main website for more wedding planning tools and huge directory of wedding professionals near you! ‹ Previous5 Memorable Save The Date Concepts!